Yes Baltimore, it is that time of the year. The time of the year when our most hated rivals are in town. No, not the Pittsburgh Steelers. I can’t believe I will actually admit this, but there is a team, when they come to Baltimore, that brings more rivalry that the football team from Steel city. Why is this team worse? Simply because of all the fans of the Yankees everywhere. But yet, when you watch or go to the games and see the fans at Camden Yards, it is overwhelmingly Yankee fans. 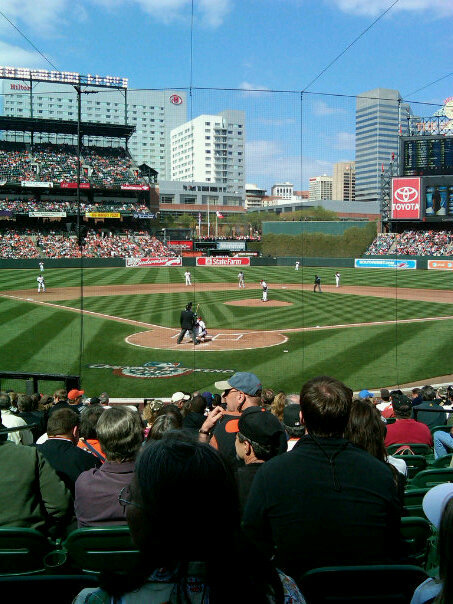 How can we stop this from happening—this take-over of Baltimore’s baseball stadium? Number one—GO TO THE GAMES! I know, I know. The O’s are on a losing streak so why waste your time and money, right? WRONG. How can a team get better or even want to get better if they have no support? Also, for all you fans out there who have already given up only a few weeks into the season, did you know that the Orioles beat the Yankees 5-4 on Tuesday April 26? The Baltimore Orioles may be a team that is breaking hearts across the city, but that warehouse and stadium are a fixture in fans hearts everywhere. The O’s are now at a 1-6 start when they lost to the Tampa Bay Rays again last night 5-1. But what is most disheartening about this losing record before May is the lack of attendence at the Yard. Last night, about 9,000 people were there. Nine thousand. It looked like fans went dressed as green seats. There are still many great fans out there. Many of them think that pitchers Mike Gonzalez and Kevin Millwood could become expendable if the O’s don’t start winning games. But tune in tonight for the second game against the Rays and hope they can turn it around. Or better yet, why don’t you go to the game? First step: Eutaw Street. Let’s go O’s! Again, check for future blog posts on other hot spots inside the stadium, and the best places to party before and after the game. Remember; the O’s have 154 games to go. There is still time to turn it all around. The Baltimore Orioles may have 12 losing seasons, but to hometown fans like Rafael Alvarez, there isn’t enough love for the team. Alvarez, a Baltimore native, created the idea of the “Daily Camden Project” with Welcome to Baltimore, Hon.com to promote the reasons why Camden Yards and the Orioles mean so much to Baltimore and the people who live there. Alvarez was a reporter for the Baltimore Sun for 20 years and also contributed to The Wire, the HBO show about Baltimore. He grew up in this area, went to Mount Saint Joseph for high school and Loyola College; he married a local girl and they raised their children in this area. Tags:Baltimore, Baltimore Sun, Camden Yards, orioles, Rafael Alvarez, the daily Camden project, Welcome to Baltimore Hon! Baltimore Oriole’s fans have dealt with a lot of pain the past few seasons. But are the O’s ready to put that pain aside and be the team fans have been waiting for them to be? From the results seen in Sarasota so far this off-season during camp, it seems like it is possible. In the pre-season opener against the Tampa Bay Rays, the O’s took the game 12-2 with two homers from third baseman, Josh Bell. Bell is the 23-year old the O’s picked up from the LA Dodgers last summer. He also had a sac fly in the fourth inning to get points on the board for his team. If you think you haven’t heard of him before, you probably have as many fans have said that Miguel Tajada is playing third as a stop gap until Bell proves worthy–what do you think?